the Lighthouse cursor is multi-functional. It allows you to navigate through the game world, utilize inventory items, and interact with the things that you see and the creatures you meet. the default cursor is a diagonal arrow, pointing northwest. Move the default arrow around a room or location, clicking on item of interest. If you click on an important object, it will appear in a close-up inset at the top of the screen. Click on the inset to interact with that object. Click outside the inset to close it and continue the game. As you move the cursor around the screen, you'll notice the default arrow changes to show possible directions of movement. Clicking a right-pointing arrow will shift your point of view to the right. A left arrow moves you left, an up arrow lets you look up, and so on. A u-shaped arrow allows you to make a 180-degree turn and look directly behind you. search for direction arrows carefully, moving the cursor over the entire screen. You never know where one will pop up! Items of interest often find their way into your inventory after you've clicked on them. the panel beneath the game screen holds up to four usable objects at a time. Your bag (found at the beginning of the game) automatically stores the extra items. To use a stored item, you must first place it in the active inventory panel. To do so, click on the bag with the default arrow to see all your stored items. Click on the item you want to remove from the bag. the selected item becomes your cursor. Now click on one of the four items in the inventory panel. the selected item goes into the panel and the replaced item goes into the bag. Close the bag by clicking on it. Now you can access the selected item from the panel. You can organize your inventory any way you like, placing your frequently used items in the panel. Inventory items can be used in the main game window or in an inset. To use an inventory item, click on it in the inventory panel. Your cursor changes to a smaller version of that item. Click again to use the item on an object or creature in the game. To put the item away, click anywhere in the inventory panel. Note that clicking one inventory item on another in the panel will simply cause the two to switch places. 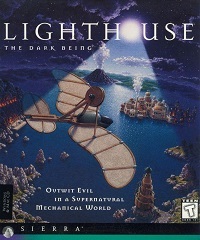 The Lighthouse icon in the lower left corner of the game screen accesses the control panel. Here you will be able to manage your saved games, quit or start a game and, in some versions of the game, select your language preference. Language (if available) - Select the English, French or German translation of the game. New Game - Start a game from the very beginning. Load Game - Restore a previously saved game from your list of saved games. Note that you'll return to the control menu after you've loaded a game. Click on the "Return to Game" to begin game play. Save Game - Save your game by typing in a unique name for it. Make each saved game's title descriptive of your current situation. It's always a good idea to keep several saved games around, in case you want to return to an earlier position. Lighthouse allows up to 20 saved games per directory. Quit - Quit the game andreturn to your operating system. Return to the Game - select this option to return to the game where you left off. Brightness - Move the slider bar at the bottom of the panel to increase or decrease brightness.